In what has become an annual holiday tradition, Clarksville’s own acoustic Celtic band is bringing their unique brand of Christmas cheer to the corner of Franklin and First in Historic Downtown Clarksville for the fourth year in a row. 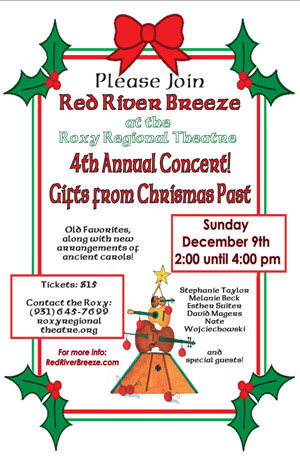 Performing traditional holiday tunes and carols with a Celtic flair, Red River Breeze will present “Gifts from Christmas Past” at the Roxy Regional Theatre on Sunday, December 9, at 2:00pm. Tickets are already going quickly for this much-anticipated follow-up to the group’s previous concerts at the Roxy, which have consistently sold out. This December’s concert will feature Stephanie Taylor on hammered dulcimer, Irish whistle and recorders; Melanie Beck on fiddle and bouzouki; Esther Sooter on cello and vocals; David Magers on guitar, hammered dulcimer and vocals; Nate Wojciechowski on djembe and hammered dulcimer; and special guests, playing old favorites as well as new arrangements of ancient carols. Red River Breeze is an acoustic instrumental group playing traditional Celtic, Renaissance, Old-Time and World music. The band, which has been in existence for over fifteen years, has five albums to their name: Friday Night Favorites (May 2006), Morgan’s Song (October 2009), The Wren at the Window (October 2011), The Bird Whisperer (May 2015) and The Babe of Bethlehem (December 2015). The concert will run approximately two hours, including two 45-minute sets and a brief intermission. Copies of the band’s recordings will be available for purchase during intermission and following the performance. Tickets are $15 and may be purchased online via the below button, by phone at (931) 645-7699, or at the theatre during regular box office hours (9:00am to 2:00pm, Monday through Friday, and one hour prior to the performance).